Today is Black Friday, the unofficial holiday immediately following Thanksgiving. Today, businesses open very early, offering reduced prices on all manner of consumer items. Customers are encouraged to flood the aisles in search of a good deal on all kinds of things - from DVDs to appliances - but, above all, electronics. Black Friday apparently got its start back in the late Sixties, but it came into increasing prominance in the last decade, as the economy deflated and retailers became ever more desperate to sell their wares. In the past, stores would open around 6:00am; in recent years, however, this has not been considered early enough. The retail industry has been involved in an arms race, vying to see who could open the earliest. This year, a number of big box stores opened at midnight. Walmart, not to be beaten, decided to start their sale prices at 10:00pm on Thanksgiving Day. This new move to open at midnight or earlier on the evening of Thanksgiving has elicited a response from some quarters. Some folks, perceiving that Thanksgiving is under attack by out-of-control consumerism, have started campaigns to resist this trend. Many are aware of the burden that this pseudo-holiday places on low-level workers: If stores open their doors at midnight, workers have to show up much earlier than that, depriving them of sleep, and the chance to enjoy the evening of Thanksgiving with their families. Black Friday, and its recent escalation, is squeezing out one of the few annual sabbaths that the working class could once count on. Yet, even if Black Friday were not so terrible for working families, and even if it did not threaten to steamroll Thanksgiving under the weight of Christmas-season merchandising, I would still be opposed to it. Black Friday is the Anti-Thanksgiving. The Thanksgiving holiday is traditionally a time to gather with family and friends and practice gratitude for our blessings. It is a time to cultivate awareness of all the ways in which God provides for us, and to pay special attention to providing hospitality to others who are hurting. 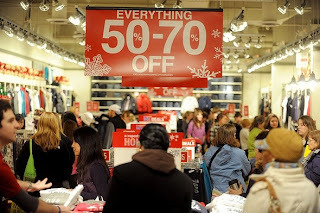 Black Friday, on the other hand, is a celebration of greed, unbridled consumerism and disregard for others. Thanksgiving is, at its best, a fleeting incarnation of the peaceable kingdom, where we can all come together in peace and mutual respect. Black Friday, on the other hand, is an intensification of the hyper-capitalist, corporate order that already dominates most of our lives. Rather than gratitude, it promotes greed; instead of cooperation, competition. 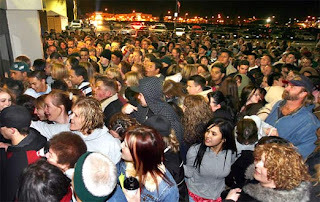 While Thanksgiving fosters brotherhood and peace, Black Friday is a celebration of self-centeredness and bickering. If you need evidence of this, examine the fruits of the Black Friday rush for the latest consumer items. There was gunfire in a shopping mall. 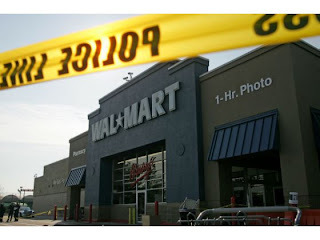 And at a Los Angeles Wal-Mart, the "competitive shopping strategy" of one woman involved the pepper-spraying fellow customers. Amazingly - though perhaps not surprising - the Wal-Mart remained open through the entire incident, and the woman was allowed to buy her merchandise and leave the store. 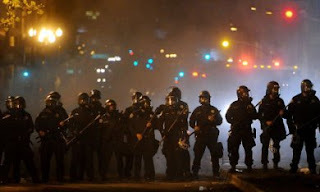 Nothing, not even outright violence, was allowed to stop the flow of consumption. How can we resist this violent culture of materialism and selfishness? This is a hard question to answer. 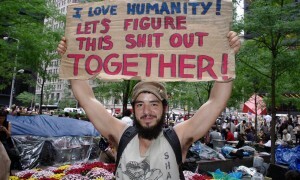 The problem goes far beyond individual choices, involving as it does a manufactured culture of scarcity and greed. There are forces at work that are bigger than any one of us. But I must start with myself. I must change my own life before asking others to join with me to seek broader solutions. 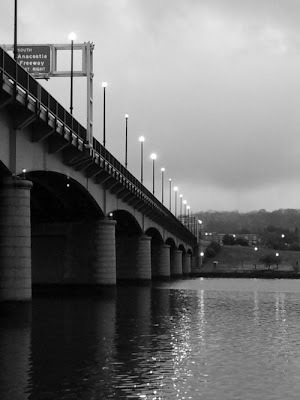 As I hope and pray for more systemic change, how can I be changed? To begin with - and, I confess, it is a modest beginning - I commit myself to resisting Black Friday. I will not participate in this anti-holiday. Today, I will buy nothing. Mike McKinley, pastor of Guilford Baptist Church, writes, "Young men tend to overestimate what they can accomplish in the short term and underestimate what they can accomplish in the long term." This has certainly been true in my own life. I can see in retrospect how much my expectations and imagined timeline revealed both my impatience and my ignorance of how human community actually works - or, perhaps, how it does not work - in 21st-century urban America. I thought that with a little determination and elbow grease I could start a new church and move on in just a few years. If George Fox or the Apostle Paul could do it, why not me? 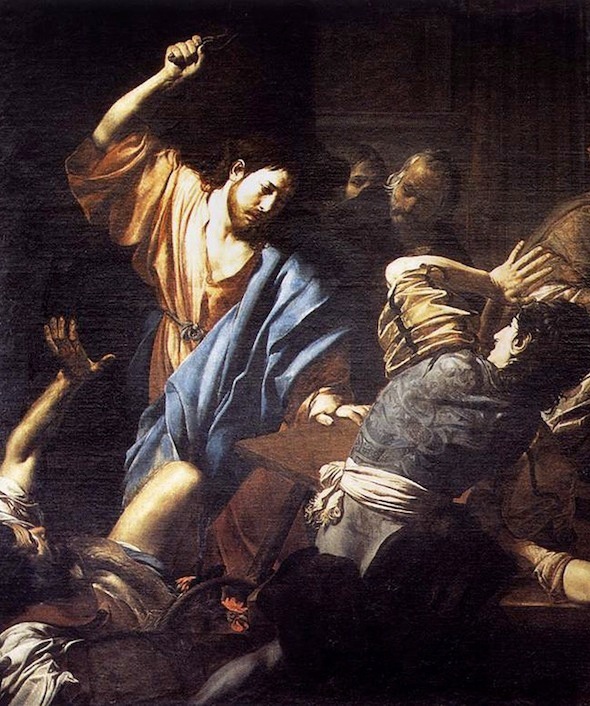 This witness requires a different model of ministry from that of Paul or George Fox. I believe that the work that God is calling me to has far more in common with that of Benedict of Nursia. Benedict is considered the founder of Western Christian monasticism. He lived and ministered during the collapse of the Roman Empire, when civilization was falling apart and human community was in great danger. In this context, Benedict offered a new way of life - a disciplined community in which women and men could live faithful Christian lives. In the midst of social chaos and confusion, Benedict held a space for community rooted in obedience to Jesus Christ. In many ways, Benedict provides a more helpful model of ministry for my historical context. However, I must admit, it is a tough pill to swallow. Frankly, I find the ministry of Paul and George Fox to be far more exciting than that of Benedict. I would rather hop from place to place, preaching and helping to gather a far-flung movement. Benedict's discipline, on the contrary, terrifies me with its admonition to stay in one place indefinitely, cultivating faithful community year after year, decade after decade. Frequently, however, God teaches me and helps me grow through those things which most challenge my natural inclinations. Though I find Benedict's model less appealing, I sense that it fits better with what God is calling me to. I am convinced that the work that is needed here in Washington, DC is not primarily the fast, mobile ministry of George Fox or Paul. Instead, I believe Christ is calling me to the slow, patient work of cultivating the vineyard of God's people. I am here for the long haul. As long as it takes. As long as God requires. 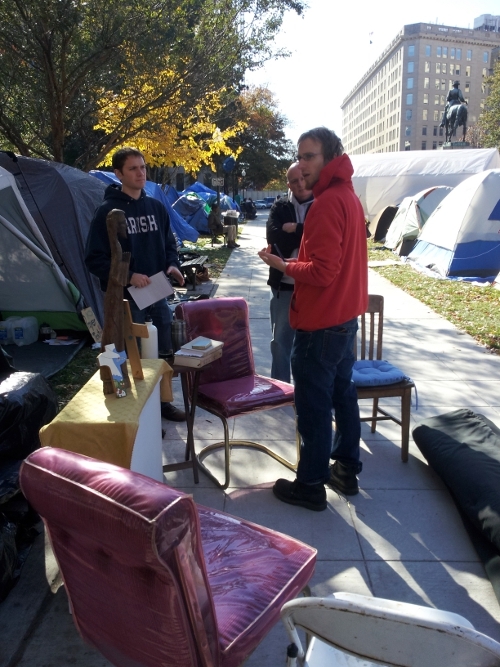 Much of my work recently at Occupy DC has been related to the ecumenical Christian presence at McPherson Square. As I have been engaged in this publicly Christian effort, folks have often asked me whether I am a pastor. I struggle with how to answer this question. What do people mean when they say, "pastor"? Do they want to know if I am a "professional Christian"? A member of the "clergy"? (1) An authority figure in my congregation? A certified graduate of a divinity school? It feels hard to answer this question authentically without engaging in a long discussion, so I usually dodge the question with a response like, "I'm a church planter." Yet, I remain unsatisfied with this answer. The mainstream Church has a very particular set of boxes that it puts ministry into, and it is a challenge to live into ministry that does not fall neatly within the predominant model. Lately, I have been doing a lot of soul-searching about what God is calling me to in my work with Capitol Hill Friends. I need to learn to better explain the broader conception of ministry found among Quakers. If we do not embrace the mainstream Protestant model of pulpit ministry, then what alternative are we modeling? Over the course of centuries, the word "pastor" has come to signify a very narrow vision of church leadership. "Pastor" has become synonymous with positional leadership, institutional authority, one-sided lecturing and monarchical control. At its worst, the pastoral system can usurp Christ's role, getting between us and our true leader. But this has not always been so. The word "pastor" is a translation of the Greek word poimen, which means "shepherd." Throughout the Hebrew and Greek Scriptures, God is referred to as a shepherd, caring for the flock. God is imaged as a strong, gentle caretaker; a loving herdsman who watches tenderly over his sheep. Jesus declared that he is the good shepherd. He cares diligently for us, and we - his sheep - know his voice. (2) Jesus has taught us to model ourselves after him, becoming caretakers of one another. If we love Jesus, we will feed his sheep. (3) This is a responsibility for all of us, not just a small group of "clergy." I have never thought of myself as a pastor in the popular sense of the word. I have a tough time with the idea being the one man in the whole local congregation who is charged with preaching, teaching, visiting with people and providing leadership for the church. I believe this model to be damaging to the congregation, teaching them to look to a human leader rather than Christ's immediate presence in our midst. I believe that the "head pastor" model can create a dynamic of dependency and spiritual sloth. Not only can the pastoral system set up an unhealthy dynamic within the congregation, but it is also frequently unhealthy for the pastor herself. It is unfair to put the spiritual burdens of the entire congregation onto one person. Only Jesus can carry that load. Despite my skepticism of the pastoral system, I am convinced that God is calling me to be a shepherd to this little flock. Just one shepherd of many, but a shepherd nonetheless. I feel inadequate to the task in many ways. I feel that I lack many of the gifts that are so important to good shepherds - especially patience. I know that I cannot be a shepherd alone, because the church needs far more gifts than God has gifted me with. Nevertheless, I will share the gifts that I have. With the Lord's blessing and assistance, I will do my best to be a shepherd to God's people. I pray that God will continue to raise up shepherds for his people. If God can use me for this work, I am convinced that the Lord can use anyone he calls: Women and men, aware of our weakness and inadequacy, nonetheless called into the ministry of the gospel of Jesus Christ. Working side by side, we can become co-laborers with our head shepherd, Jesus. 1. Can someone provide a scriptural basis for the "clergy/laity" distinction? 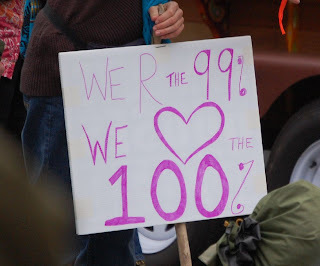 Since the Occupy movement began almost two months ago, we have been under steady pressure. 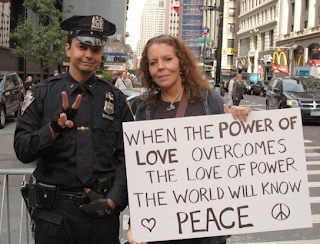 From the beginning, in New York, we suffered unprovoked violence on the part of the police. In recent days, these attacks have only increased in severity as the Occupation spreads across the country. 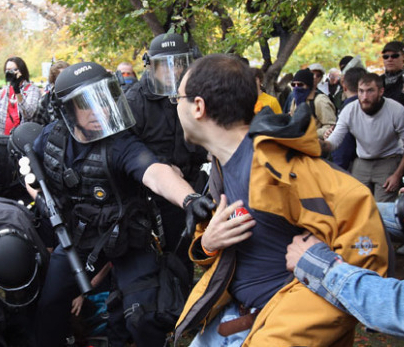 The good news is, the attempts to neutralize the Occupy movement with force have failed. Every time the police have unleashed violence upon us, we have grown in numbers and resolve. The world is indeed watching, and the people know injustice when they see it. One lesson of the past months is clear: violence against unarmed, peaceful demonstrators only strengthens the movement for change. So far, we have stood our ground as a movement committed to the practice of nonviolence. Despite vicious provocation by security forces, there have been remarkably few instances of violent acts on the part of demonstrators. Given how angry many of us are, and how intense the repression has been in some places, this is a major accomplishment. The enemies of the Occupy movement want nothing more than for us to abandon our commitment to nonviolent direct action. 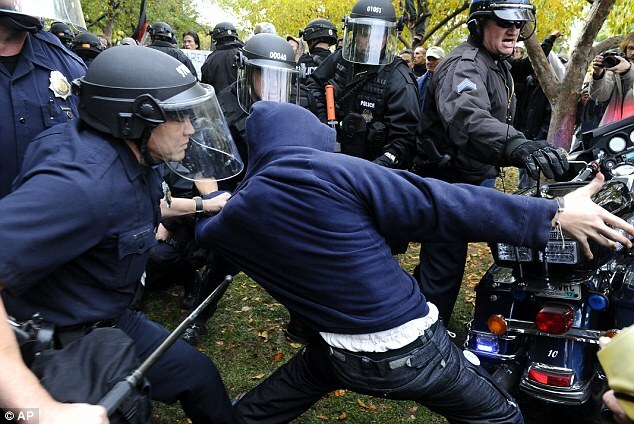 They want us to try to defend ourselves from the brutality of the police; they want us to hit back. They want us to break windows and spraypaint grafitti. They need this desperately, for as long as we refuse to fight on their terms, they are powerless to stop us. Only by provoking us to violence can they assume the mantle of "law and order," tamping down on our "anarchy." We must not allow the violence and calculated provocation of the security apparatus lure us into retaliation. 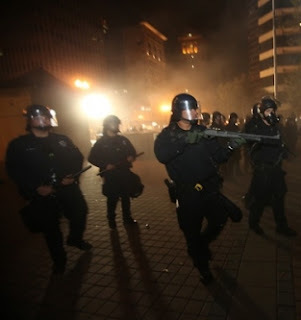 Police around the country are beginning to shift tactics, and their ultimate goal is to get us to hit back. They know that, if we give into fear by striking back, they can crush us without mercy. Nonviolent resistance is the hardest road there is. It requires incredible courage, discipline and faith. It requires a depth of hope and imagination to be able to see that receiving violence is more powerful than inflicting it. We must call upon deep reserves of spiritual strength and mental fortitude in order to stay calm in the midst of savage behavior by the authorities. This will continue to be a deep challenge; but it is the only way we can win. 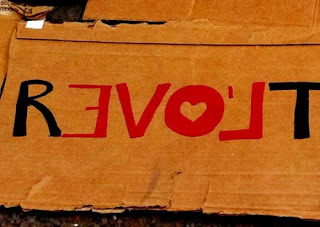 Let us recommit ourselves to the path of nonviolent non-cooperation with evil. Let us pray for the strength to look our enemies in the face and show love to those who are beating us. Let us trust in the power of love to overcome the brutal power-plays of hate. There is a love that says "no" to the darkness, that refuses to be seduced by hatred and violence. This love, if we have the courage to stand in it, will be our path to victory. 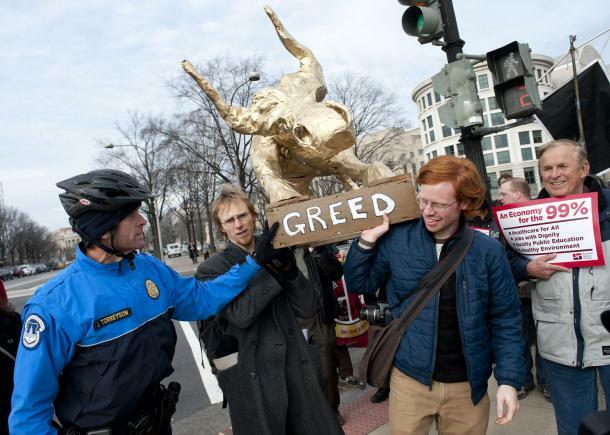 This month, I have been deeply involved in the Occupy movement here in Washington, DC. We launched Occupy DC at the beginning of October, and the following month has been one of strengthening, developing, and seeking to unify the movement into an effective force for change. My role in this process has changed over time. Early on, my focus was primarily on the work of facilitation - ensuring that our decision-making process was functioning properly. 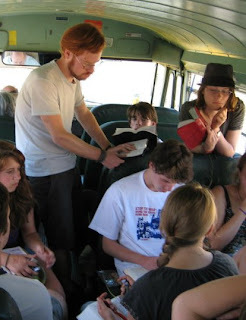 Once we got the facilitation team stabilized, I shifted my energies to outreach. I worked to develop ongoing efforts to reach out on behalf of Occupy DC, especially through direct leafleting on city streets. In recent weeks, my role has shifted again: I have become increasingly involved in outreach to people of faith, especially Christians. This began in collaboration with Brian Merritt, a Christian pastor who was involved very early on in developing space for people of faith to gather and support one another. We hope that people of faith will help ground the movement in the peace and stability that only God can provide. 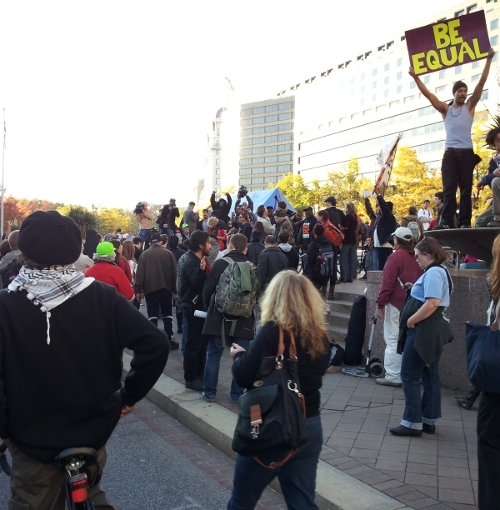 We have participated in gatherings of religious leaders who are seeking ways to be supportive of the Occupy movement. I have also begun to give talks to Quakers in the DC area about the nature of the Occupation, and how Friends can get involved. This looks to be an ongoing effort, as these grassroots efforts for change are only intensifying. 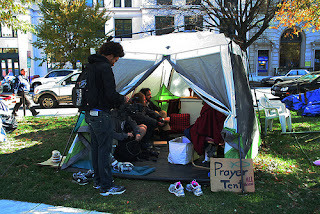 Perhaps the most visible thing that we Christians at Occupy DC have done is to erect the Prayer Tent. Complete with an altar, religious art and furniture, we have established a small chapel in the midst of the camp, which serves as the base of operations for the ecumenical Christian presence in the camp. We have begun to hold weekly worship services on Saturday afternoons, and we are doing our best to be available on a daily basis to our fellow occupiers. 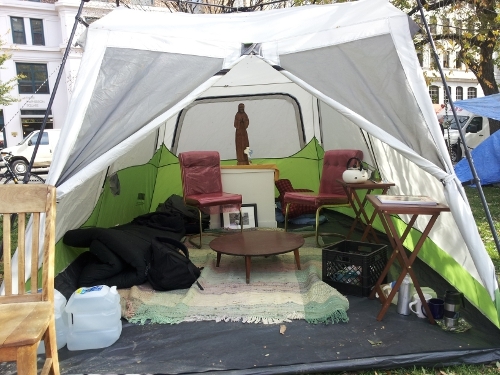 The Prayer Tent presents a great opportunity to practice a ministry of presence and listening. A big priority for us is getting folks to take a shift sleeping in the chapel at night. 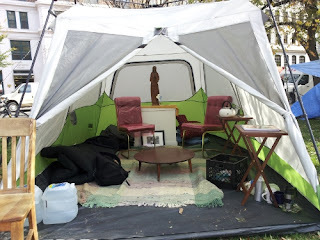 This is extremely important given that the Prayer Tent has been abused repeatedly in our absence. We need a continuous presence to preserve the space, and would welcome anyone who feels able to come out, whether for a few hours or to spend the night. For my part, I plan to sleep out this Wednesday night with another member of Capitol Hill Friends. While the Christian presence at Occupy DC is still struggling to take its first steps, the Occupation as a whole is growing up fast. 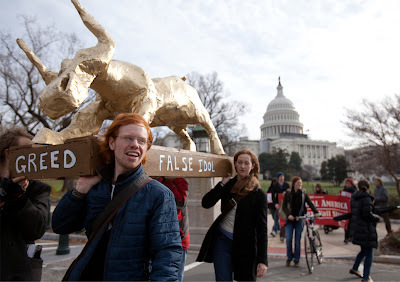 With perhaps thousands of individuals participating on some level, and many hundreds showing up for actions, Occupy DC has reached a delicate moment in its development. While most of the occupiers are people of good will, there is a small minority that is more concerned with expressing pent-up rage and aggression than with advancing the cause of truth. This is a huge challenge for us as a movement, since we have no centralized leadership to impose order on the various tendencies that are now found under the Occupy DC umbrella. 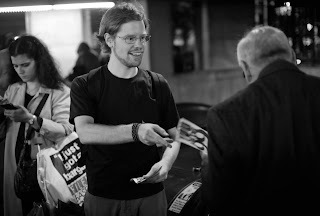 On Friday night, we had a very successful march and demonstration at the Washington Convention Center, where the Koch Brothers' Americans for Prosperity was holding a gathering for their supporters. The action overall was solid, but there were some individuals who were taking actions that were more aggressive than most of us were comfortable with. While we were able to mitigate their impact to some degree, we had a number of people who were behaving rudely, even aggressively. To be clear, Occupy DC committed no acts of violence or vandalism. 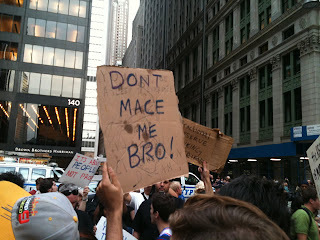 On the contrary, the only violence Friday night was that which was perpetrated on us by others. Nevertheless, it is clear that some of our people overstepped the bounds of civil discourse. This saddens me on multiple levels. As a supporter of this movement, it seems tragic that the good work of so many might be undercut by the lack of discipline on the part of a few. As a Christian, it is disappointing that some of us are not yet ready to return love for hate, forgiving those who sin against us. 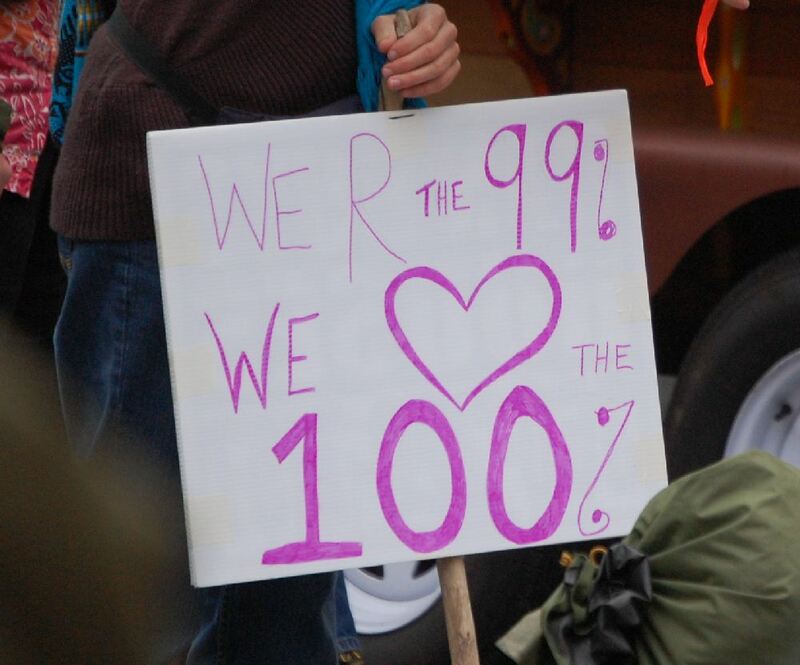 The Occupy movement is not perfect. 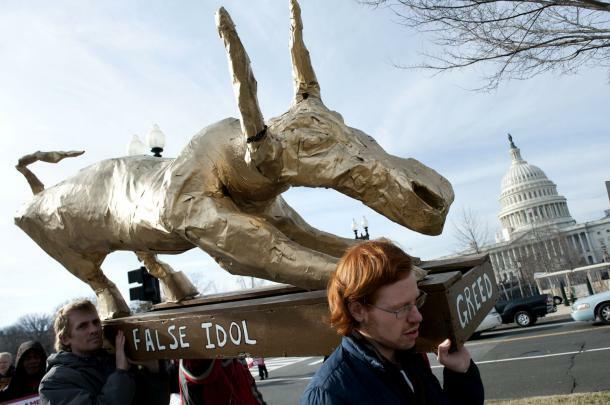 It is made up of a huge assortment of individuals, some of whom hold worldviews that I find false and life-denying. Nevertheless, I still believe that the Occupation on the whole is coming from the right place. We have the opportunity to stand as a prophetic voice in a country that for too long has ignored our own arrogance and greed. Yet, we must be wary of the temptation to give ourselves over to our own arrogance and short-sightedness. My prayer for this movement is that we might move beyond the need to prove ourselves with blustery words and grandstanding. Instead, I hope that we will stand humbly, with a simple message of repentance for a proud nation. This is all I have to offer. With all the energy I have poured into Occupy DC, I have grown increasingly aware of the need to take extra time out to focus on nurturing Capitol Hill Friends. In the last week or so, I have been re-orienting my life to balance the needs of both the Occupation and of Friends in the local church. I feel like I am reaching an equilibrium. After a month and a half of disorienting novelty and change in my daily routine, a new "normal" seems to be emerging. It is a life in which my attention and energy are split between family, the Church and the Occupation. Fortunately, there's a fair amount of overlap. My understanding of ministry has been greatly enhanced by the organizing I have done for Occupy DC, and I value greatly the new relationships I am building with church leaders here in DC. Perhaps the hardest thing for me to balance so far is my need for ongoing study and prayer. While I have kept up my usual prayers and Scripture reading, I often feel very accelerated and unfocused. It is hard to stay grounded and aware of the Lord's presence when there is so much to do. Especially in a movement like this, where the details unfold at the speed of Internet. Sometimes, I just have to unplug. I have been grateful for all of you who have been praying for me during this very exciting, stressful time. I feel like my life is in a momentous transition; everything is changing. I need God's help to stay rooted in that life and power from which all positive change emerges. Please continue to pray for me, and for all of the brothers and sisters here in DC.